Sea, Sand & Sky: Swim and Paddle 2013: What a Blast! Swim and Paddle 2013: What a Blast! This past Saturday instead of sleeping in or watching another re-run of Saved by the Bell, I was up bright and early to help out at Save the Harbor's Swim and Paddle Board for Boston Harbor. 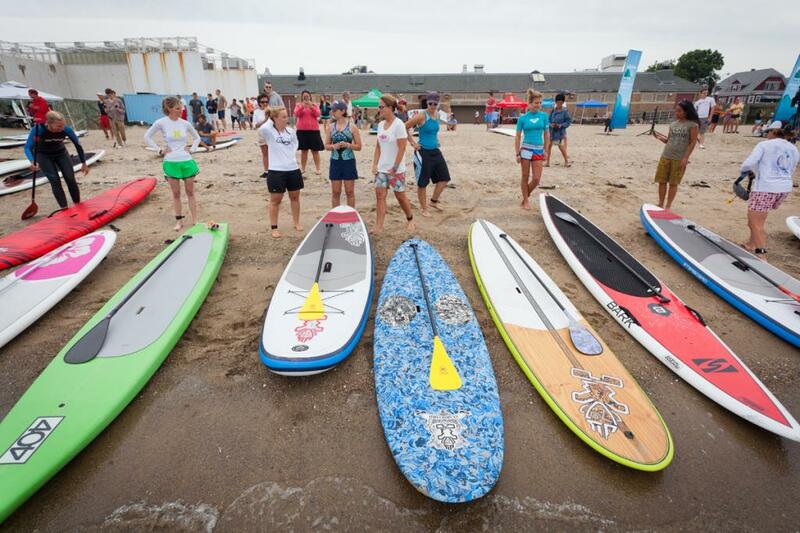 This swim and paddle board race was held at the Curley Community Center in South Boston, and we had a GREAT turnout. This was the first year that a stand-up paddle board competition was part of the event, and I thought it was pretty cool. I first tried paddle boarding on a family vacation and although I was nervous that I would topple over, I thought it was easy once you get out on the water. This year the paddle boarders were very impressive, racing out to the buoys and back again before I could even believe it! I and several other summer staffers teamed up with the office staff to man the registration table and distribute food tickets for Tasty Burger after working up a sweat in the races. 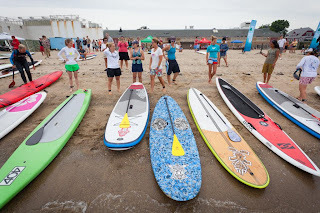 There was also paddle boarding lessons at the end of the race, Vita Coco water tastings (but no Dustin Pedroia sightings unfortunately) and SurfRider apparel for the boarder in your life. Despite the overcast skies, everyone had a good time and raised a ton of money -- good job to everyone involved! Make sure to have next year's swim and paddle on your calendar! Ode to a Great Summer! My good bye to you. Second to Last MLK Scholars Workshop! Miracle happened at the last day. Friends of Wollaston Beach KidsFest. Day on the Island Clam Seeding! Let's go do some clam seeding. Time To Chef It Up Sea Food Style ! North End Family Pride Day! First time kayaking in Pleasure Bay! We were stuck on an island! All is fair in kick ball! In the Kingdom of the sick. Working out with the Red Sox! !